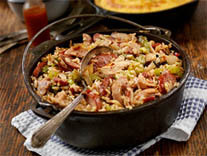 Carolina Pride adds a bit of Southern flavor to this classic Italian meal, made with sweet Italian sausage and lots of mozzarella. Preheat oven to 350°F. Make bolognese sauce. Sauté onions in pan with olive oil. Mix in Italian sausage and brown. Mix in 2 jars spaghetti sauce and shaved parmesan. Set aside. Cook bacon. Bake in preheated oven until crispy. Drain grease and allow to cool. Chop into small pieces and set aside. Cook noodles according to package directions, but do not allow to get too tender. Using tongs, place the noodles on wax paper to cool. 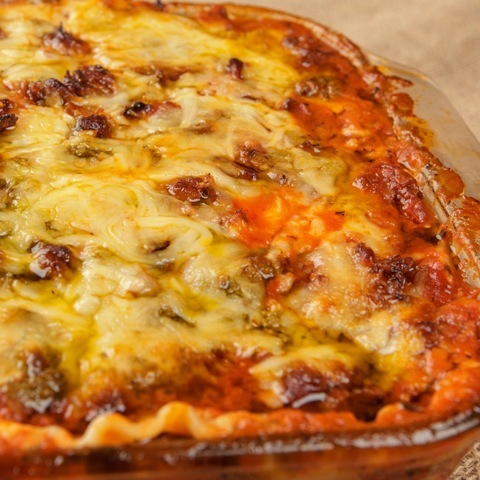 Place ingredients in a 9” x 13” lasagna pan or casserole dish in the following order: Bolognese sauce, bacon, mozzarella, 1/3 jar of pesto, noodles. Repeat until all ingredients are used. Bake in 350°F oven for 30-45 minutes or until cheese is golden brown and bubbling.